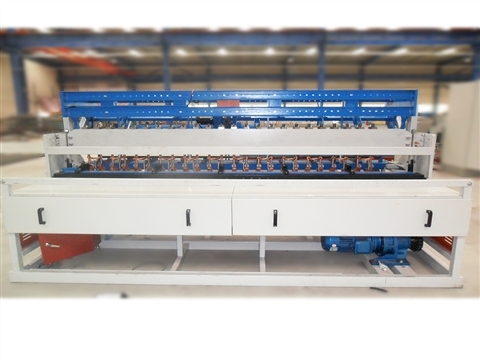 The structure of the weft feeding mechanism of the building steel wire mesh welding machine is novel.The automatic feeding of the stepping motor and the technology of the national patent technology make the weft welding process more accurate and solve the problem of no welding or leakage welding of the double wire. 5.The machine uses fine-tuning of the frequency during welding to reduce welding pollution. 8.The pitch of the weft wire is automatically changed when the input hole of the computer is entered. The large-scale intelligent chip is used in the building steel wire mesh welding machine control system,and the highly integrated design makes the core control system fully integrated in a small-sized controller.This controller integrates all functions of strong electric weak point control.Simply press the standard plug-in to pull out a small number of negative lines to control the entire machine operation,without the need for intermediate appliances,conversion boards and other spare parts.The sensors are all two-wire,which greatly simplifies the line and is user-friendly.It is powerful and practical,and has functions not available in other control systems.